Today I went to my first ever YouTube meet up. It was all very surreal, but lots of fun. I'd been packing up my things all day (I'm moving to London tomorrow!!!!) and lost track of time and arrived a bit late. It was very weird seeing two people you normall watch on a flat screen all in the flesh and 3D, but like I said lots of fun. Louise and Zoe were lovely, and both gorgeous! You can really obviously tell what great friends they are, just from the way they interact. And Baby Glitter was there. I was overcome with cute, she is adorable!! We all talked about what make up things we'd bought, comments they get on YouTube, how you can accidentally spend a fortune in Boots without noticing (I've done this SO many times!) and people who don't collect Boots points. Yes, there are people in the world who don't collect Boots points. Louise and I both said that we hoard ours. I occasionally get vouchers in the post offering me more points if I spend a certain amount of money and then I go mad! I love Boots points! I was quite nervous but very quickly relaxed. 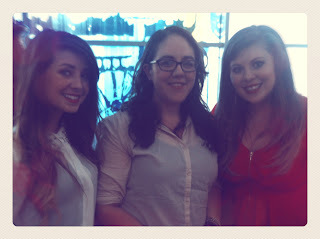 Thanks to Louise and Zoe for organising the meet up, for being so lovely and friendly and for making awesome videos. Awww it must have been so cool ! Wish I were here, but since I live in the South of France, it was a bit complicated to me to come ! It was lots of fun but yes, coming from the South of France would have been a bit of a journey!